Life is short. Eat well. Thanks for visiting GretaCooks! I’m Greta and I started my blog in 2013. It’s been nearly six years now and, whoa, how things have changed!! When I started my blog, I was living in a tiny apartment and my two teenaged sons had just left home. I was single, living alone and totally discouraged with internet dating! Long story short: I was bored, lonely and bordering on depression. Something had to change. I’m an artist and, at the time, I was working full-time as a Public Art Administrator. While I loved curating exhibits for other artists’ work, I really missed making my own. I missed the thrill of creating! I didn’t have a studio at home (like I said, tiny apartment) so my kitchen became my studio and food became my medium. 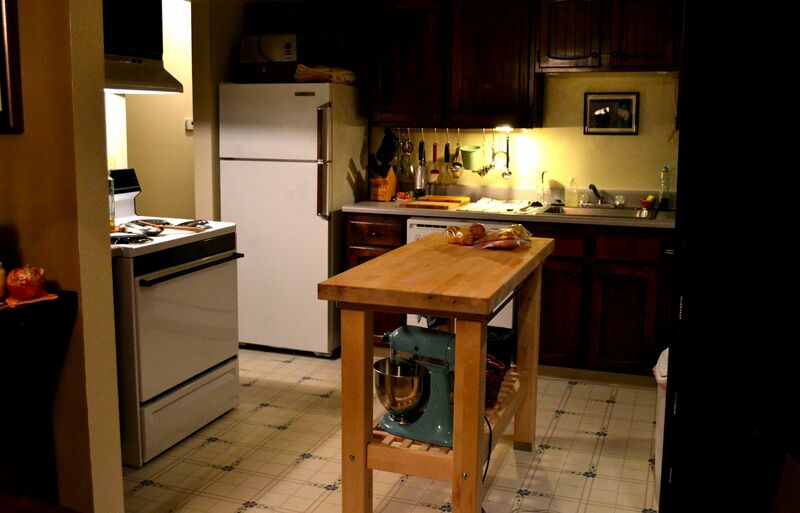 Here’s my tiny apartment kitchen from 2014…. I’ve always loved the beautiful decadence of French pastry, so I started making it myself from cookbooks. It felt wonderful to be creating again! I’ve never had any kind of professional training – I’m just good at following directions – and I love to learn. One issue I kept having is that many great cookbooks only offer one image! That can be frustrating for visual learners. So many times I wondered, “Am I doing this right?”. From the start, the objective of GretaCooks has been to follow trusted recipes, share process shots of each step along the way, and create beautiful food. So I started creating (and photographing) beautiful, wonderfully delicious and decadent food! Who’s Going to Eat all this Food? I started taking food to the office and my co-workers loved and hated me for it. Most of my creations were rich French pastries and cakes… after awhile, everyone in the office had to start dieting. …so I decided to make pies for the Maintenance guys who painted my exhibit walls. They painted a lot of walls so there were a lot of pies. After awhile, I became known as the Pie Lady. Cool. In all, between 2013 and 2015, I created 56 blog posts! view the gallery. Instead of name-cards, I made these little avatar paper-dolls for all 50 of our wedding guests. Fun! In 2016 I married my super-handy sweetheart, John. We bought a house (with a big kitchen!) and I started creating my own art again. This mosaic is called “Letting Go of Shoulds”. It’s a mixed media piece (textiles and stained glass). Now that things have settled down a bit, I’ve decided to get blogging! My goal is the same: to share step-by-step process images of challenging recipes for those of us who are visual learners…. I hope you will join me in this continued food adventure! Click the follow button on the home page for email updates. You’ll receive a brief notification about once a month when I post a new recipe. I will never spam you or share your information. Also, I LOVE to hear from other adventurous cooks, artists, or anyone challenging themselves to try something new! NY Cheesecake and something extra! Tis the Season for a Holiday Trifle! Banana Pudding Pie, Oh my! When life gives you lemons, make lemon sauce. Marla on Banana Pudding Pie, Oh my! John on Banana Pudding Pie, Oh my! Gretacooks on ’tis the season for Rhubarb Roulade! Marla Harrison on ’tis the season for Rhubarb Roulade!